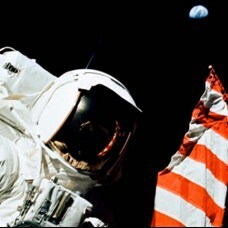 40 years ago, Neil Armstrong and Buzz Aldrin set foot on the Moon during the Apollo 11 mission. I mention this as I always have been attracted by space conquest, the Apollo program and so on. Nowadays, the US government is thinking about what should follow and is wondering where we should go first, back to the Moon, or straight to our neighboring planet ? As a teen I was reading about the future Mars program and how we would go there by 2035. This is what Aldrin and Collins are now advocating. But it seems we may have to wait until 2050. Mankind already set foot on the Moon, so the goal might not be as thrilling as Mars, a place so far and so different that it would an entirely new challenge that all nations would have to partake to allow Mankind to succeed. This is to me another goal all Mankind – after climate change mitigation and the protection of the environment – should commit itself in the first decades of this millennium. What Is The Carbon Footprint of The Space Program? If I am not mistaken, for a while, they considered the mid 1980s for a manned mission to Mars. Considering the broad technological gap between the Wright brothers and the moon landing being accomplished in 66 years, it should have taken, at worst, half as much time to land men on Mars. That would have been in 2002! I guess oil crisis, environmental concerns and other pressing issues came in the way. I don’t know Gilles, I read about 2035 when we were in the mid 1990s. What NASA or else thought in the 1970s or during the Apollo programm is absolutely unknown to me. ← Is Peak Oil real ?